Nail fungus on feet and hands; how is it removed? Nail fungus belongs to a very common problem among the population. A common problem is also the nail fungus on hands but not so much as the one on feet. People easily ignore to mention problems, especially when they occur on feet, while they are even not aware that it is not completely a harmless problem. For all of you who have these problems we have prepared this article and some advice. Nail fungus on feet and arms in medical terminology is called onychomycosis. How do we know whether we have a nail fungus? Fungal nail infections in most cases begins on the inside of the nail. In the early stages there is a change of color, it becomes thickened, brittle and distorted. Fungal infections of the nail are most rapidly developed if they are exposed to moisture and heat. Prolonged wearing of closed footwear, using common shower in sports facilities and swimming pools is extremely conducive to the spread of infection. There are many medications that are quite successful and effective in eliminating these problems, we will give you some advice exclusively related to natural treatment without chemistry. These infections are frequent and common in the elderly population. 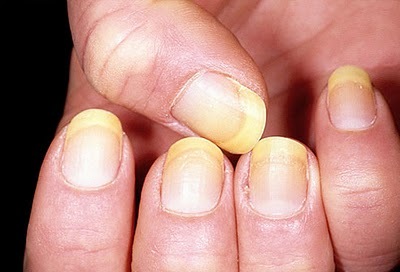 The reason is that after a 40-year of age the nails grows more slowly and thus are less resistant to fungal infection. There is also an increased risk for the fungus on the toenails to occur due to increased sweating of feet or wearing socks and shoes that do not absorb sweat and do not allow normal ventilation of feet. If you walk often barefoot and in moist places it can also contribute to its spreading. Nail fungus on hand are much less common than those of toenails, resulting in people whose hands are often exposed to water and various detergents. With artificial nails humidity below the nails occurs and can cause the growth of fungi. Discoloration of the nail - it can be whitish, yellow or greenish color. Thickening of the nail - in addition to thickening, it becomes fragile and bent. The debris from the destroyed part of the nail is gathered and compressed under the healthy part of the nail and then the entire nail is separated from its place. Nail fungus can be pretty painful and not at all harmless. Research shows that if they are not treated properly and in time they can cause much more serious problems. When combined with other diseases they significantly impair the overall health of the individual. People with a weakened immune system, diabetes should not overlook nail fungus on hands and toes as a cosmetic problem, but devote themselves seriously to solving the problem. Any minor injuries on the feet as well as aforementioned fungal infections in such individuals can lead to complications, such as wounds that do not heal and the like. When and how to seek medical advice? We strongly recommend that you consult your doctor at the first sign of infection to find out what you are dealing with. At first symptom like color change you should go to a doctor. Otherwise it is a very progressive infection that spreads all over the nail, ie the nail plate and then the treatment is much slower and longer. The doctor makes a diagnosis based on the appearance of the nail and on the basis of content taken from nail, which confirms the diagnosis under a microscope that identifies the fungus. The most important is good hygiene of feet and keeping the nails clean and dry. After each stay in the water, whether showering or bathing on the beach dry thoroughly your feet, nails and especially the part between the fingers. To prevent fungus on the skin and athlete's foot. If you are a person whose sweat excessively, replace socks more often. If you are constantly on your feet wearing shoes, use every free moment to take off your shoes when you have an opportunity to do so. Change all closed shoes (with closed fingers) to open ones. To prevent nail fungus on hands use rubber gloves when washing the dishes. Regular dry the gloves and turn them on both sides when using them. Never remove the skin around the nails, because this opens the space for the various bacteria to penetrate to the nails. If you have infected nail mandatory to wash your hands, because you will spread the infection to other ones. Do not walk barefoot around public showers, pools or in the changing room. If you go to salons for a manicure and pedicure, be sure to select those reliable, regularly sterilize instruments. Ingredients: lavender oil, smoke tree and 70% alcohol. With a few drops of this mixture lubricate the underside of the nail up to a maximum of 3 times a day. This natural remedy has proven to be very successful for persistent nail fungus on toenails. Tea tree oil combined with other herbs proved effective in combating fungal infections of the nails. The combination of chamomile with licorice in the form of a hot bath relieves inflammation, provides better drainage and regenerates damaged tissue. We should not forget the garlic that is considered the most powerful natural antibiotic that successfully eliminates the fungus. Clean the clove of garlic and mash it in stone or wooden mortar. Add to that a small teaspoon of finely grated ginger root and tea tree oil (5 drops). All should be thoroughly mixed in a mortar until you get a thick paste. The resulting paste is spread on the diseased nail and covered with a cotton or linen cloth. This natural cure for nail fungus is very effective especially if you started using it in the initial stage of infection. In the case that the nail fungus has already started and strong pain is present, lining will not be effective. In a warm bath add ginger, oregano and sage and daily rinse your feet with it. This bath will be beneficial for your nails against the fungus on your feet if you have them. Mix the lemon juice with apple vinegar, add the juice of black and red currants. With the resultant mixture moisturize the nails once a day. Mix 5 grams of beeswax and one egg yolk (hard-boiled), and melt on steam in a small plastic container. Add a few drops of peach oil, apply the mixture on the nail daily. We recommend that you read some of our texts: water retention in the body and swelling of the legs, how to remove acne on the face, oregano oil, graviola cancer drug from nature, etc.